Smartphones, tablets and the apps that run on them are everywhere these days. But what if you want to make your own app? Do you have to spend hours writing code to get a simple app running on your phone? No! App Inventor makes it easy to build your own apps without writing code. For Dublin Maker 2016, we wanted to show people how easy it is for them to make their own apps, but in a way that makes use of the lovely new venue – Merrion Square. At our booth, visitors to Dublin Maker can build an app for themselves or explore Merrion Square with something we’ve prepared earlier! 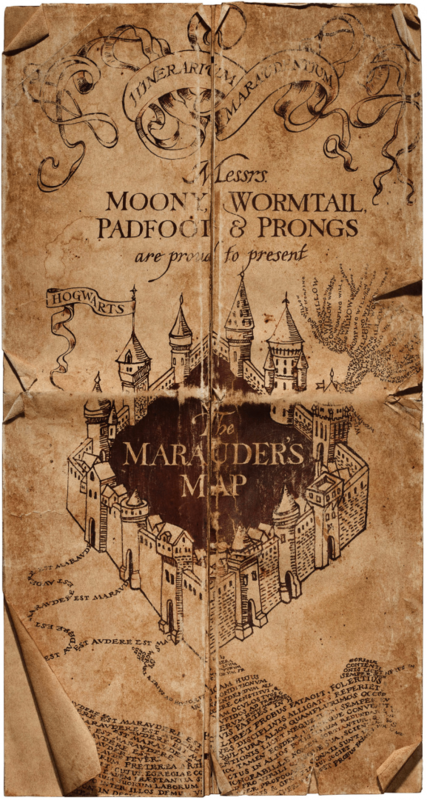 Anyone who knows anything about Harry Potter will know about the Marauder’s Map, created by Messrs Moony, Wormtail, Padfoot, and Prongs. 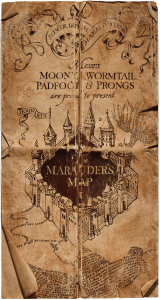 For any muggles who don’t know, the Marauder’s Map is a magical document which shows the location of every person in Hogwarts. Makers will be able to build an app that uses their phone’s GPS signal to tell our map where in Merrion Square they are. We solemnly swear that you won’t have to code. This one is for the visitors who want to have fun with an app, but don’t want to make one! QR Codes (short Quick Response Codes) are extra clever barcodes, and they can store all sorts of information… like clues for a treasure hunt! Almost every smartphone has a camera, and you can use the camera to read QR codes. With this app, visitors to the maker faire will explore Merrion Square hunting for QR Code clues. This is another app you can use to explore Merrion Square. If you know how far away a tree is, and you know what angle you have to look up at to see the top of the tree (the angle of elevation), you can work out how tall the tree is (using trigonometree…). Smartphones have special sensors called gyroscopes that can tell what angle the phone is at (its orientation). 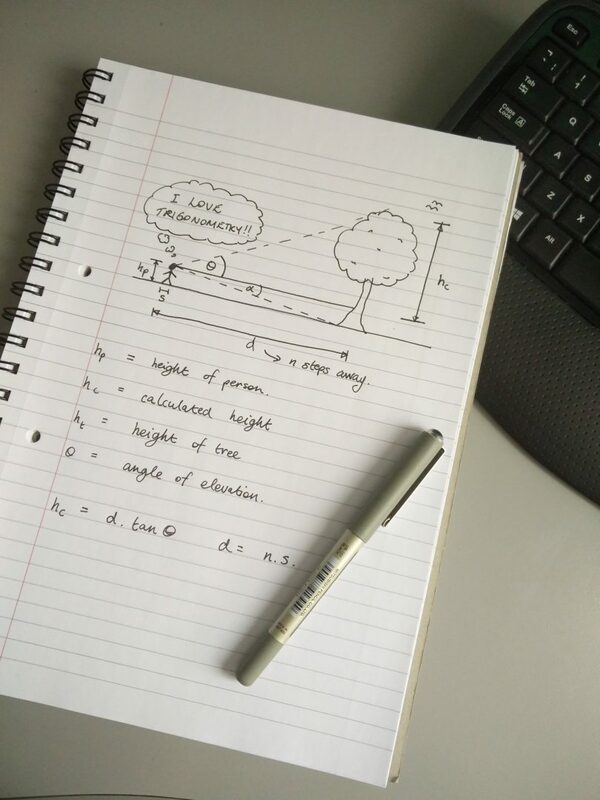 We can build an app that lets us use the gyroscope to measure the angle of elevation of the trees. Some special trees might even have QR codes on them that will tell you what kind of tree they are and how old they are. We love trees, but we couldn’t go to Dublin Maker and leave our robots at home! Most smartphones have Bluetooth, which lets us control all sorts of things wirelessly, including robots! We will have robots that drive around, and a robot arm too. You can make your own app to control them, or you can use one that we made earlier! Note: the platform we are using only supports Android devices at the moment, sorry to all the iPhone users! Check out NUI Maynooth Maker Space youtube channel. I am so excited to read this! Only last week I was trying to calculate the height of an oak tree in the Phoenix Park using the instructions from Scouting for Boys. I will be along to your stand on Saturday with a view to co-operating as my project is the Tiny Forest one; WildAREness. We are working on a tree guide and the QR codes were what we had in mind! Congrats on this great work!